Mother Nature and Hopatcong State Park personnel control the water level in Lake Hopatcong. Hopatcong State Park personnel manage the lake level as outlined in the 2011 Lake Hopatcong Water Level Management Plan. 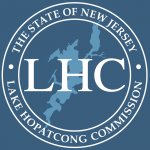 The goal of the plan is to protect the environmental health and the natural and scenic resources of Lake Hopatcong/Musconetcong River System, maximize recreational opportunities, minimize the potential for damage to property and waterfront structures, while maintaining the minimum flow requirements necessary to protect downstream uses, including but not necessarily limited to: aquatic biota, historic resources and water quality. Each year the NJ DEP Division of Parks and Forestry - State Park Service follows procedures to to manage the level of Lake Hopatcong. However, the annual precipitation does effect the raising or lowering of the lake. Up to date information on the Lake Hopatcong water level is provided by the USGS Gauge located in the gatehouse at the Lake Hopatcong Dam. Both the 26 inch (22 inch as per the NJDEP pilot program) annual drawdown and the 60 inch (five foot) drawdown dates will vary depending on the water level. See the Lake Hopatcong Water Level Management Plan 2011 for dates. 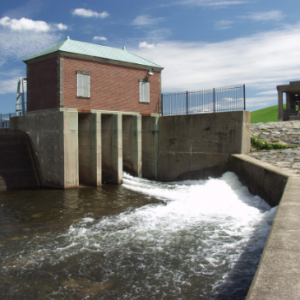 The 26 inch (22 inch as per the NJDEP pilot program) annual drawdown begins on or after November 12 except when the 60 inch drawdown occurs every fifth year. Starting in late winter or early spring, depending on when the ice breaks away from the docks, rainfall is allowed to raise the lake level. The 60 inch (five foot) drawdown is scheduled every five years and begins on or after September 22. During the 60 inch drawdown from December through February, when ice conditions permit, the lake is allowed to rise but not higher than the 26 inches below the spillway elevation.